These AFV's have been on my desk for a couple of months now, waiting to get their decals. I like decals but they are a pain to put on. I have to apply gloss over the area, then apply the decal, then apply gloss and then apply matt. I think you get it! All the decals are from Aleran, first class and excellent service. Three of the tanks were painted by myself last winter and 4 of them were purchased painted but the rest were painted in the last couple of months. The ones previously painted and purchased underwent extensive modification with stowage, camouflage and rust applied. I have been building tank units for Bg Chain of Command, which allows the fielding of tank platoons as support to the the infantry platoons. Since tanks usually come in boxes of 3 from PSC, it is pretty easy to paint up several. I think I am pretty stocked up on mid war with some late war, but really no early war. Anyway on to the photos. 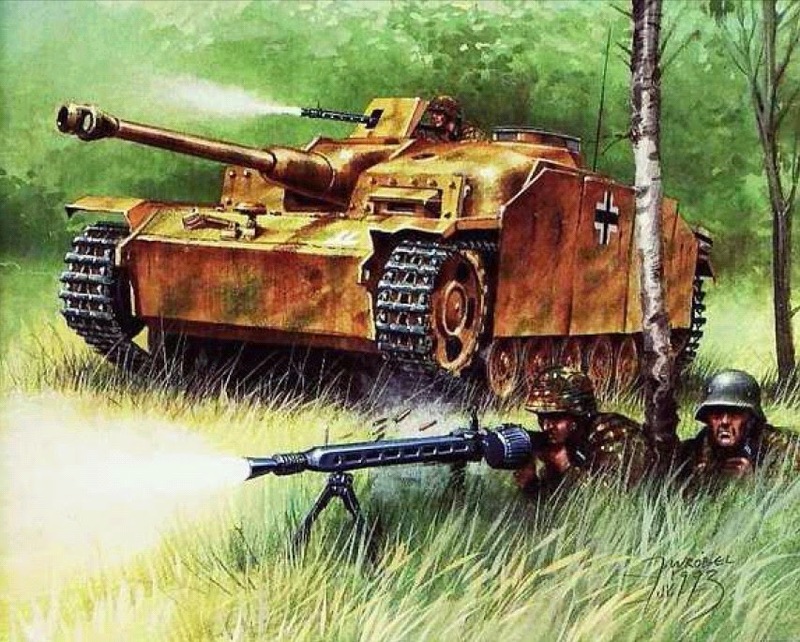 A Brummbär (Sturmpanzer 43), support list 8. This was purchased painted. Two StuH 42, one purchased and one painted by myself for last years Challenge. A support list 7 or half platoon for Big CoC with a -1 list rating. These are from Armourfast. StuG III, a support list 6. Here we have a full platoon, with a +4 rating for Big CoC. Three are from PSC, they are modeled as Ausf G, the Armourfast model is a Ausf F.
Panzer IV's from PSC. all but one painted by me. These Ausf G are support list 7, 4 tanks is a slightly under strength platoon, so a +6 in Big CoC. Panzer III, a support list 5. This is also an undermanned platoon so these Ausf J, would be a zero in Big CoC. These are from PSC. A Tiger II, unknown manufacturer. I purchased this painted and it appears to be all resin. This is a support list 11, but Big CoC allows an Tank Ace to be used, so this is a support list 13 option! A massive and excellent drop of armor! I think my favorite is the Tiger II in your very last shot. Not a sight any allied army wants to see! Thanks Monty, the Tiger II is certainly massive. Impressive, and not a little scary! Nice work! I am hoping they are Panzer III's! The stowage does make a difference. Massive column of AFV's! Looks great. I do like how they look in a column.